UMY Broaden and Signed Cooperation with Berau Regency as part of MoU to foster the micro-potential of local and rural area in Indonesia. 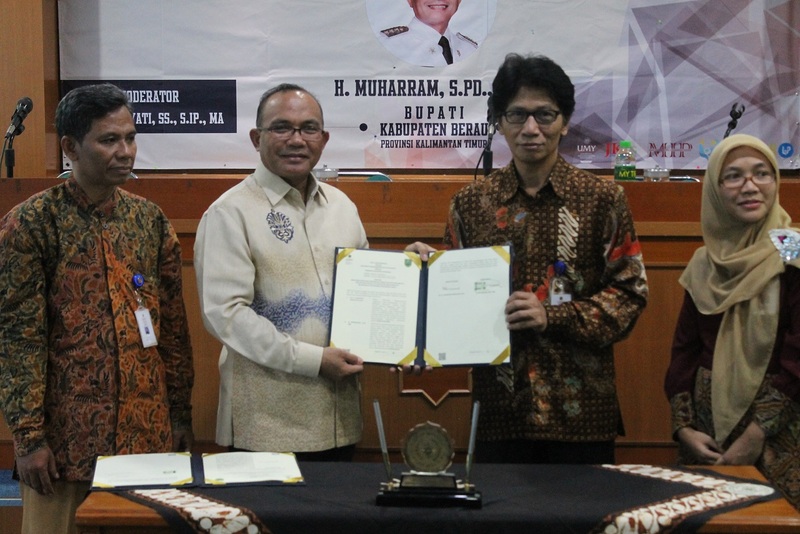 Friday, 20 October 2017 – Universitas Muhammadiyah Yogyakarta (UMY) has signed a MoU with Indonesia’s local government, namely Berau Regency form East Borneo/East Kalimantan. Memorandum of Understanding (MoU) was signed by Dr. Ir. Gunawan Budiyanto as the rector of UMY and H. Muharram, S.Pd., MM. as the Regent of Berau Regency, at 4th floor in Kasman Singodimedjo Building (Postgraduate building), UMY. This cooperation represents willingness of UMY to participate actively on developing Indonesia, especially in the rural and remote areas. This cooperation hopefully could be benefical for both UMY and Berau Regency in terms of: community service & Berau’s potential development. Beside, we can underline this mutual cooperation as follows: managing & preserving our natural resources from uncontrolled exploitation and illegal logging from local or foreign companies. In this occasion, Dr. Ir. Gunawan Budiyanto reminded all the audience about the importance to preserve and mantain natural resources from a massive destruction. He also pointed that Berau and Borneo as important and strategic ‘world-lungs’, regarding to the huge numbers of the natural resources to produce ecosystem in the globalisation era. After the MoU signed, the agenda was continued by the public lecturer that was delivered by Regent of Berau Regency: H. Muharram, S.Pd., MM. entitled “Best Practice from Berau Regency to Realizing Regional Progress”. This agenda was attended by students, lecturers and practioners of Jusuf Kalla School of Goverment.